I’ve never really been a fan of the Shazam/Captain Marvel property. I haven’t exactly disliked it, but I’ve never really had any active interest in it. Actually, my primary interest has probably come much more in retrospect in the last 10-15 years, looking back to where I came across the character(s) in the 10 or so years prior, and seeing how the concept’s been worked into the general DC Universe, and given the history as tough competition to the Superman publications. In more recent years, I neglected to follow the Trials of Shazam series, though seeing the changes wrought by Infinite Crisis and its lead-up seemed to hold a lot of potential. I just never really got around to going back and checking up on the saga. I was curious, and interested. Which, finally, brings me to the book itself: Shazam! Volume 1. This book collects the Shazam! feature from Justice League (2011) #s 7-11, 0, 14-16, 18-21…or 13 chapters. Being–as I understand–functionally “backup” or “co” features, these were each significantly shorter than a standard issue, so these 13 or so chapters work out to approximate six issues…making this a standard-size volume overall. That I was able to get the hardback for $15 shipped made it like getting a paperback, but the added “plus” of actually being a hardback…though that’s probably moreso the immediacy, as my curiosity had gotten the better of me and I was more interested in checking out the New 52 iteration of the property than caring about having a hardback vs. paperback. The cover’s depiction of the character is a bit “off” to me, looking questionably sinister, power-mad, or at the least, slightly creepy. Based on the interior, it looks to me like that image was from a variant cover of an issue of Justice League, and seems modeled after the 2012 #0 issues of the New 52. Fitting, as this is the introduction of this version of the character…not so fitting as it’s the only image of the character that stuck out to me in that way. Gary Frank‘s art is a definite draw for me, and made the book quite easy on the eyes. Everything taken solely in context of this single volume, I haven’t much to say about the art other than I enjoyed it quite a bit–in general as well as the character designs themselves. Adding my knowledge of more Shazam stuff than just this volume, Mary seemed a bit too “old” and not so “innocent” as I’m used to seeing the character (excepting Final Crisis and such), and I’m not familiar with Pedro, Eugene, or Darla offhand. Additionally, the hooded full cape isn’t an aspect of the costume I’m used to, though Frank makes it look good. Story-wise, it was a bit stranger to me seeing a more rebellious, cynical Billy Batson, one quite lacking in the wide-eyed worldly wonder and “Holey moley!” of even the ’90s take on the character. While that’s long been a relatively defining aspect of the character, its absence in this was actually quite welcome to me. This Billy seems much more grounded and realistic, and it’s a lot easier to identify with the character himself. That there are echoes of the typical “with great power comes great responsibility” refrain thematically doesn’t hurt things, either. 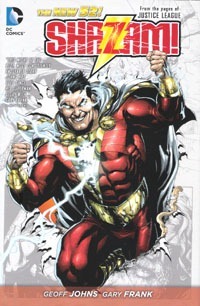 I also found that I don’t at all mind the missing “Captain Marvel” name, as I’ve grown up with Shazam as the cover designation involving the character(s). It remains to be seen the long-term designation of the siblings’ names, but as I’ve (as of this writing) yet to even read Ordway‘s Power of Shazam series, I have no particular vested interest in the old naming convention. Throughout this volume, we get to see some honest growth of the character as he first takes advantage of his power, then attempts to learn to channel it, and finally shares it and steps closer to being the hero he’s gotta be. We also have the introduction and a bit of development of the villain–Dr. Sivana–whose quest for Black Adam and access to magic dovetails into the overall arc of Billy getting HIS powers and stepping into action. Sivana’s motivation also rings true, as he’s seeking to save his family with the magic and not “just” some mad scientist-type scheming against the magical hero. There were a number of splash pages, enough that I couldn’t always tell where a chapter definitively had ended. In this single-volume format, that’s definitely a good thing…yet it underscores how much I would have hated this in its original serialized format. 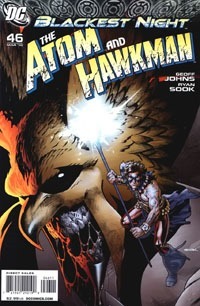 The story taken as a whole–this entire volume–works very well, but pull out any one chapter by itself and there’d be a lot left wanting for that chapter–either focus on Billy and his building relationship with his new “siblings,” or continued development of things on Sivana’s end with Black Adam. As touched on earlier–I very nearly bought this for full cover price just for the immediate gratification…but currently holding an Amazon Prime account with free 2-day shipping, I forced myself to hold off in order to save $10 (40%). At the $15 I ended up paying, this was more than worthwhile as a purchase. The full $25 might be a bit of a stretch…but as a hardcover, it’s not a horrible value, and as something I was actively interested in acquiring TO read, this seems one of the better volumes I could have chosen. All in all…I’m quite satisfied with this book, and the amount of time it took me to read the thing cover to cover for its price compared to the same price for say, four of last month’s Villains books. I don’t know that I’d jump into buying single issues with a continued backup series featuring Shazam or the Shazam family, but I would certainly check out an ongoing title or occasional special. 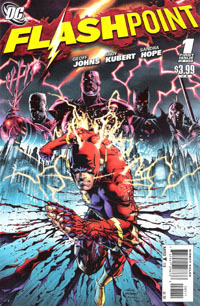 Flashpoint #5 was a rather quick read for me. For now, not much in the way of emotional investment: I read #1 a few months back, but that was the last I’d read. I picked this issue up solely for the promise of it “explaining” the transition to the New 52. In and of itself in that regard…I probably could have done just as well to not bother buying this. 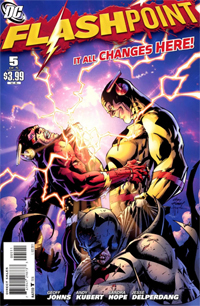 The story moved pretty fast, and was mostly this epic final battle between Barry and Thawne (Flash and Reverse-Flash). Thawne had screwed with Time–killing Barry’s mother–and Barry had tried to set things right, resulting in a the screwed-up “present” of the Flashpoint universe. When Barry realizes what he has to do to TRULY put things right (at great personal cost), he gives it a shot–and seems to succeed. Of course, what he doesn’t know is that there are minor differences–while some things are as they should be, others are drastically different…as will be discovered throughout the New 52. That the story feels like primarily one huge fight scene, an ambiguous “emotional moment” with Barry and his mother, followed by an ambiguous epilogue scene doesn’t give it much to go on in and of itself as a single issue. That hurt my enjoyment of it–and my rating of it–but I’m sure it’s got much more resonance with someone who has read the entire series. The art on this book looks great overall, and I really enjoyed it. Of course, as with the writing, most nuances were lost on me at this point, not having read issues 2-4 nor any of the tie-ins. I do intend to read the full story when the collected volume comes out, and perhaps the tie-ins as well. I just wasn’t going to follow this entire event as single issues with numerous issues to buy at full price every single week for months. (I also hadn’t initially realized the significance of this particular event until things were underway, or I MIGHT have considered otherwise). My core quibble with the art is “the” 2-page spread that’s supposed to explain things: there’s reference to 3 timelines, though I feel like I saw 4…not sure which was doubled, or if there were 3 timelines PLUS the Flashpoint line (which may be, but not having read the core of Flashpoint, I can’t quite tell visually). If one were to read this issue “in a vacuum,” that is, without knowing about the New 52 and such, the ending would seem on the one hand to be pretty much a non-issue: Time gets screwed up and put back, Barry remembers, and the main thing beyond that is to impact Batman. on the other hand, it would seem to be rather open: with multiple timelines instead of just changing one line back to another, there seems to be a new timeline formed, ripe for exploration. Unfortunately, I must leave it to others for now to determine if this was a good ending to Flashpoint as a whole. As an ending to the DC Universe I’ve spent the last 23 years with, it’s not a horrible ending, but it’s almost unneeded. Probably the main thing for me about having this issue is to have it–to be in on the end and the beginning this week, having also grabbed Justice League #1. If you followed Flashpoint, obviously this’d be an issue to get. If you’re just jumping into things for the relaunch, you’d be just as well-served to find the image of “the” spread online rather than buy this issue out of context. Black Adam attempts to bestow an honor on The Question and Montoya, while the Shadowpact and Ralph attend to the helmet of Dr. Fate…and as an ‘afterthought,’ Booster gets a funeral. I’m not terribly thrilled with the choppiness on these issues–it sometimes seems like the story "jumps" a bit, and given the format/size of the issues, there’s not much room for "smooth transitions" exactly…and I can see where one would totally benefit from reading several weeks’ issues in a row. Even for a comic that’s out each week, a "previously" page would certainly come in handy. Viewing this series as a massive tv series (2-3 seasons in one, by giving new episodes for 52 weeks) makes for a good way of looking at it–with some episodes having a focus on one theme, others focusing on a specific character or largely on just a specific character. But even weekly shows often show a few clips of what happened "Previously, on __________." Noticing the art seems to me to come largely from reading others’ thoughts the last several months, about there not being "top-tier talent" on the art for this series–I honestly don’t mind the so-called "second-stringers" on art–as usual, I’m not offended by the art, the characters are all recognizeable, and it’s clear what’s going on panel-to-panel, really. There’s nothing in the art that totally jumps out at me or blows me away–but I for one am definitely satisfied with said art. We’re basically 1/3 through the story now, and starting to get some handy payoff to plots that’ve been building throughout. Ralph Dibny seems to be getting around quite a bit, when he does show up. Here he’s interacting with the Shadowpact, as they attend to the helmet of Dr. Fate, and the liquified previous user (who, I suppose, was previously established somewhere, but the name means nothing to me). I’m definitely interested in Ralph’s story, a lot more than I would’ve thought a few weeks ago–but between his dealings with the Connor-Cult and now the helmet…I’m interested in where these writers take the character. This issue also gives us a look into the aftermath of the Question and Montoya’s actions at the Black Adam/Isis wedding and the impact things are having on them–especially Montoya. I don’t remember much detail from anything I read of her in the first One Year Later, except that she apparently dealt with some traumatic stuff in the missing year–this looks to be at least one of those events. 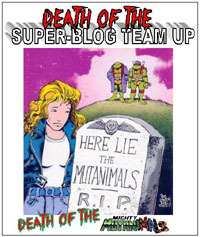 We also get to see the crap-fest that is Booster’s funeral. Apparently the pall bearers are of some "classic" significance to long-time readers; I didn’t recognize any visually or by name–but I suppose that’s as much the point as not. I don’t like the way Booster’s been portrayed in much of this series–but one has to admit, at least, that even in the funeral situation–there’s a consistency to this particular portrayal. There’s a glimmer of potential as to the future found in this issue, and if you’ve seen the cover to next week’s issue online, you should have a pretty good idea of what’s coming. Overall…this issue’s a bit of "same old, same old" as far as this series is concerned–the story moves forward, the art gets the visuals across to complement the story, and there’ll be an issue next week. If you’re following the series anyway, it’s worth keeping up. If you’ve not been drawn in yet…I don’t think this issue’s gonna do much to change your mind. I’m still not entirely thrilled with these origins…the visuals can be cool, but the way I, for one, am wired, I see panels laid out and I want a story, more of a narrative than just fade-in/fade-out flashes with a little bit of text in captions. The highlight for me of this particular origin is that it’s a character I am not terribly familiar with, so it at least has some new information for me–or at least, confirms stuff I’d sorta picked up without realizing it. While I’d prefer a couple extra story pages to this sort of "origin," 1. I could see these making for a nice special issue in themselves, as a collection of all these "origin backups" once the series concludes. Perhaps as Who’s Who of 52 or some such. and 2. even though not highly detailed, they at least would allow someone to be able to say "Hey, I recognize that guy..!" If you’ve enjoyed these 2-pagers, this should be no exception. This issue fills us in on the fourth week of the first month following the conclusion to Infinite Crisis. Several of the core plotlines are at least touched on in this issue. Renee Montoya finds herself entirely bored and frustrated at a pointless surveillance job–a job that keeps getting interrupted by The Question. Some astronauts–I think they’re astronauts–get a glimpse of hope at finding the heroes lost in space during the crisis. Additionally, Booster and Fire discuss the way Booster’s going about his hero-ing, as Fire comments on Booster’s initial reaction to the loss of Ted last year. Ralph Dibny speaks with Cassie and her ‘cult’ as she’s promised him answers and the possibility of seeing a certain lost loved one. The final plot touched on this issue is John Henry Irons as he contemplates what he’s done by having rushed into the hero gig without thinking–what creating Steel has done in his life and others’ as well–and leads us into what might be a bit of a change for the character. In a way, it feels like there’s not a LOT that happens in this issue–but with no less than five simultaneous, ongoing stories all being told, that’s to be expected. The scene transitions feel a bit choppy–not entirely interruptive, but at least a couple times I found myself flipping back a page to see what day I was on, and then was surprised when the main story ended, not having registered that it was the end of the week. In a sense, it might be fairly easy to be taken out of the story considering the week ends ‘conveniently’ at a cliffhanger. Despite the aforementioned choppiness, I didn’t feel like I was reading multiple stories by distinct writers–which I feel is a good thing, given that this is overall a singular story of the events ocurring during the "missing year." The writing in and of itself is good, and conveys the sort of slice-of-life scenes of these characters. The artwork is good–nothing much negative to say about it, really. Visually, characters are all recognizeable and distinct, and I didn’t catch myself at any scenes wondering who a character was because of artistic interpretations of familiar characters. The art may not be singularly distinct and recognizeable specifically (the way, say, Alex Ross artwork might be)–but it is clear and clean, and gets across what needs to be conveyed visually in the story, and that is the main concern. The only story point that really jumped out at me offhand was Steel’s–I’m not certain, but I think we’re seeing where his history has been modified somewhat, possibly undoing stuff from several years ago. And frankly, I’m ok with such modification, as I wasn’t thrilled with said events as they originally unfolded at the end of Superman: The Man of Steel. Taken as a whole, I’m still not entirely sure what to make of this format. While it’s not perfect (and I can’t quite put my finger on anything that WOULD make it perfect), I’m enjoying it thus far. Of course, 4 issues down leaves us with another 48 issues to go… This ride’s just beginning, and DC‘s got me hooked for the present. Have I mentioned that I’m lovin’ this series? There’s something about it that just really works, and I’ve enjoyed each and every issue so far. This issue sees Booster and Beetle recruit their former teammates from the Justice League International days, as they take their fight into the midst of an Infinite Crisis unfolding differently from the one we know…since Booster has messed with the timeline by saving his best friend’s life. While the JLI is being re-formed, Maxwell Lord and those in his power continue to see to Lord’s plans for the world working out as they might have, had events from Countdown to Infinite Crisis occurred differently. The issue moves along nicely, providing some cool reunions and believable, in-character reactions to other characters’ presence. There’s also a sense of something big on the horizon, and though one can guess at the permanency of the status quo, there’s still excitement and hope as to what the outcome will be after another couple issues. The art–as usual and as now expected–is also very good, and seems perfectly suited to these characters. This issue is as much a treat to look at as it is to read…and getting to do both makes it one of the finest comic series I’m currently reading.